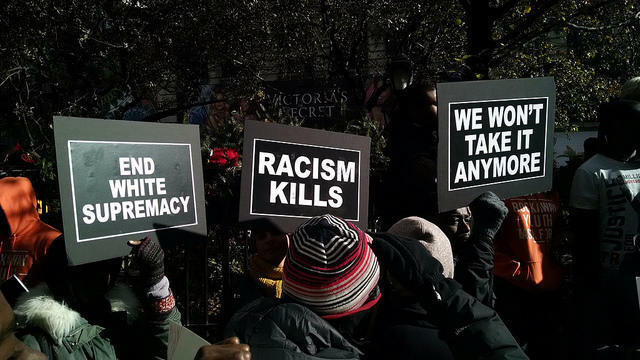 From a Ferguson protest in New York City. Peaceful protests continued through the weekend in Madison, Wisconsin, after an unarmed black teenager was killed by a white police officer Friday night. It's the latest conflict between police and the communities they protect. In Michigan, the state's Department of Civil Rights is working around the state to try to build trust between police and the communities they work in. Executive director of the Michigan Department of Civil Rights Matt Wesaw said he believes Michigan is “well above the curve” in building this trust. Wesaw credits an outreach program known as ALPACT – Advocates and Leaders for Police and Community Trust. The state began the first ALPACT around 18 years ago in Detroit when citizens complained that the city’s law enforcement officials were wrongly profiling and harassing them. “As a result of that, the decision was made – involving U.S. attorneys, other high-level law enforcement folks, government leaders, faith-based leaders, community leaders – to sit down at the table and talk,” Wesaw said. “Basically it was to develop better lines of communication and also gain an understanding of, on the law enforcement side, why we do what we do and how we do it,” he said. That, he said, is the problem. With five ALPACT chapters currently established around the state – in Detroit, Saginaw, Flint, Benton Harbor and Grand Rapids – he said Michigan is ahead of the game. Wesaw says two recent incidents in Michigan speak to the outreach program's success with opening lines of communication between police and citizens. The first occurred in Dearborn Heights when a young African American female was killed by a white man. Some members of the community were enraged after Renisha McBride was killed while standing on Theodore Wafer's front porch. Wesaw said the police opened up lines of communication, asking citizens to allow them time to assess the situation. Their assessment led to the man’s conviction. “The civil unrest, the destruction of relationships, and quite honestly community property was averted,” Wesaw said. The second and most recent incident occurred in Saginaw where a homeless man was killed by Saginaw police. After this case’s investigation, prosecutors and the Department of Justice decided that the police officer had acted appropriately and that he would not be convicted.